Anyone can grow something somewhere thanks to container gardening. How’s that for an abstract statement about a concrete subject? We can grow something somewhere. How about a pot of lettuce in the kitchen window, a celery stalk cut down and planted in a coffee mug, or carrots in a food storage container? This container is 10 inches tall by eight inches across. 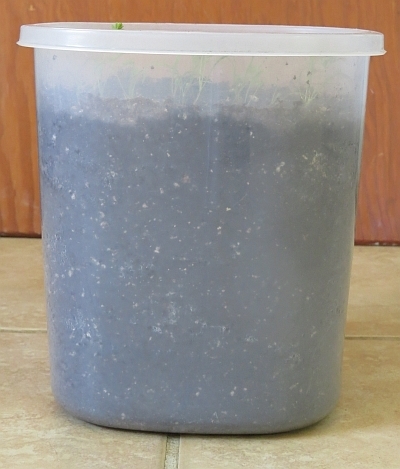 I filled it with a 75/25 mix of ProMix and well-finished compost. Choose a carrot variety that is at least an inch shorter than your container. I’m growing Napoli, a variety that grows up to seven inches long. They do well in containers, raised beds and in the regular garden. Carrot seeds were planted one inch apart starting one inch from the outside of the container. You don’t need to measure. They’re carrots, they’re not that fussy. Carrot seeds must stay moist while germinating so I covered the container with plastic wrap. 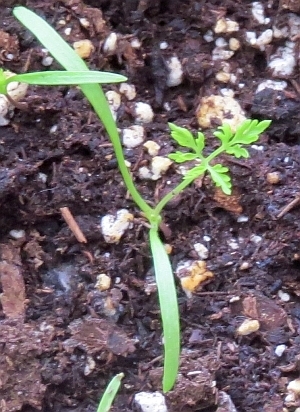 You shouldn’t have to deal with many weeds when container gardening but just in case, this is a carrot seedling. I moved the container outdoors as soon as the weather warmed enough during the day, bringing it inside on cold nights. Small containers like this one are easy to move around as necessary. On cold days that kept the container in the house I moved it to follow the sun if I walked by. 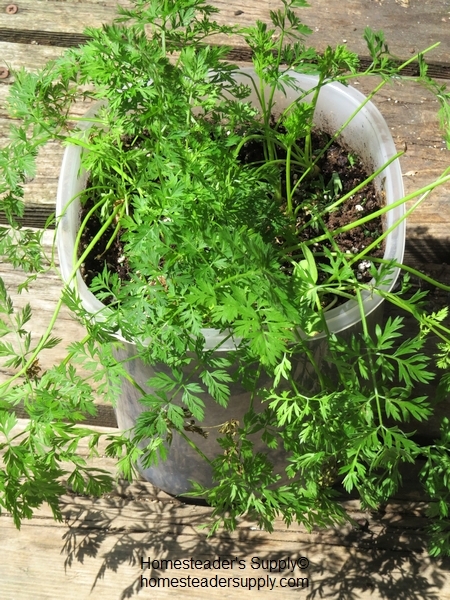 Napoli carrots grown in a container. Thin the plants as they grow. If you managed to get just one tiny carrot seed per inch you are my carrot-planting hero and I hope you’ll share your seed-spacing tips. I plan to pull every other carrot as they run out of room but it doesn’t always work out that way. Pull the carrots that need to be pulled. They should all be ready to pull within 10 days of each other. If you’d like to start again you can dump the growing medium out, amend it with compost and replant. I use the same growing medium two or three times for carrots and once for a leafy green before dumping it into the garden and starting again. Have questions? Leave a comment and we’ll come back to help. This entry was posted in Uncategorized and tagged container gardening, Gardening on June 16, 2014 by Homesteader's Supply. Am I reading this right? 10 DAYS from sprout to harvest for this variety of carrots? That wasn’t clear, was it! Thanks for asking. All of the carrots should be ready to harvest within ten days of each other.